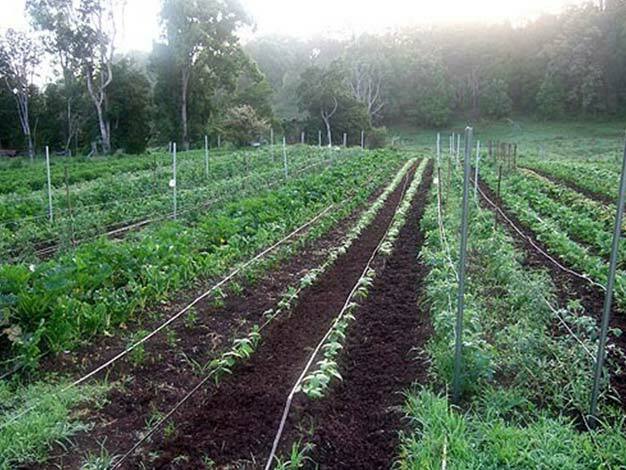 This week the ISKCON New Govardhana farming project in Australia received organic certification from the national Organic Growers Association. After several rigorous inspections, the farm was granted a certificate of compliance which allows all fruit and vegetables grown to carry the official OGA logo. “In the 1970’s, Srila Prabhupada, the Founder Acharya of ISKCON, taught that our farms should use sustainable agricultural techniques. The public are increasingly becoming aware of such methods, so gaining accreditation by secular standards sets a precedent on the farm that allows us to credibly interface with them”, says Ajita Dasa, manager of the New Govardhana project. Extra produce that is not used at the temple can now be sold on the organic market which is currently in high demand. Secondary cottage industry products such as jams, pickles and sauces can also be sold as certified organic which opens up many entrepreneurial opportunities for the farm’s householder residents. The farming community will also be able to avail the help of volunteers enrolled the Willing Workers on Organic Farms (WWOOF) program. The WWOOF program allows international volunteers to learn about organic farming by assisting in the operation of running farms. In exchange they are provided food and shelter for the duration of their visit. The New Govardhana project, originally purchased by ISKCON in 1976 for AU$80,000 [US$76,000], sits on 1,000 acres in the fertile Caldera region of northern New South Wales. Krishna Farm is home to 75 residents and 65 cows and bulls.